Trying to photograph these glass ornaments can be a bit challenging, but they are really quite pretty IRL! 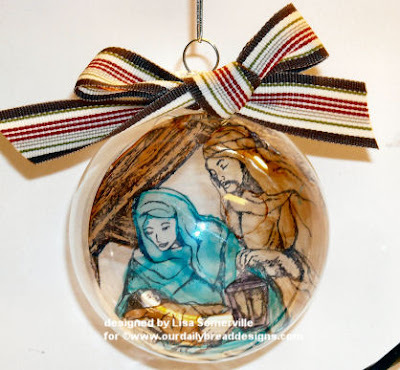 I used the Alcohol Ink Painting Technique to add color the Our Daily Bread Designs - Joy to the World image stamped that I had stamped on acetate. Remember you want to color from the backside using your Blender Pen filled with Blending Solution, or it will take your Black ink right off! Also, if you put drops of Alcohol Ink into a paint pallet and let them dry, it makes this technique a lot easier! Then you just pack your pallet away and take it out the next time you wish to paint. Lisa, this is so cool! How pretty! !